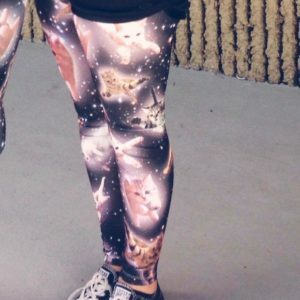 Considering I own three pairs, it’s safe to say I value cat tights. Last week I met with a women I respect and admire. I had recently completed some branding work for her, but this time we were meeting to discuss her product line and I was very, very eager to hear what she had to say. Flash back to one week earlier, when we were corresponding back and forth over Messenger. She was tying up some loose ends before taking some time off work, and I had previously expressed an interest in the line of health and wellness products she represented. I was a pretty cold lead at this point – nowhere near ready to purchase, and frankly unable to justify the budget for it. What a question. I could physically feel myself react to it. Why? Because – and the answer was very clear in my mind – I do value my health. I value wellness and feeling strong and healthy and all that good stuff. I really, really do. In fact, it’s a big part of who am I and how I like to see myself (I am careful to offset it with wine and cider vices – balance and all that). By the end of the conversation, we’d set-up a time to meet and talk further over coffee, and I was already writing down the questions I had. I was a very, very warm lead. Over the next few days, I couldn’t stop thinking about that one simple question: What Do You Value? If the product or service aligns with our personal values, we will move mountains, and funds, to have it. Customers are looking for brands whose products and services help them to do what they need and want to do, in a way that makes them feel good about themselves. Needless to say, I bought the product. And even better? I was super excited when it arrived – no buyer’s remorse – I couldn’t wait to see how it was going to help me live more fully in alignment with what I valued. So what’s the lesson here? Simple. If you don’t already know what your clients and customers value, find out. What is it about your product or service that connects with this value? Spend some time in the shoes of your customers and write down what you know. If you can, ask them directly: What are your core values and how does my product help you connect with them? Knowledge is power when it comes to branding. The actionable step is this: Make sure your company’s visual branding, core messaging and overall creative is aligned with that core value. Because Core Values Drive Business. I help small and medium-sized businesses connect with their audience through strategic, meaningful creative. And I’d love to help you! Contact me to find out how graphic design, visual branding and brand strategy services can help grow your business.